First came the Gatorade shower for head coach Mickey Donovan, then the swarm of maroon-and-gold-clad players and coaches giving each other high-fives, chest-bumps and hugs on the sideline. Finally, quarterback François Dessureault kneeled down one last time at around midfield as the head referee blew the final whistle. 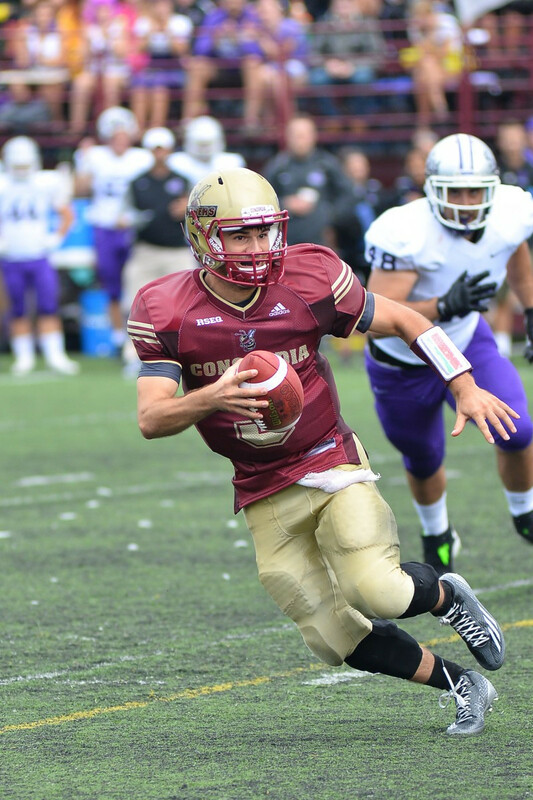 On paper, it clinched a regular season game like any other—a 25-15 Stingers’ victory over the Bishop’s Gaiters. But for a team that hadn’t won a league match since 2012, you could forgive the Stingers for being overly enthusiastic after their win on Saturday at Concordia Stadium. “We stuck together,” said Donovan, fresh off his first league game as Stingers head coach. Fourth-year slotback Jamal Henry was so overcome by emotion, his eyes red after shedding a few tears. The Stingers’ last win dates all the way back to Oct. 13, 2012, when they took down their rivals, the McGill Redmen, in a 43-40 thriller at Percival Molson Memorial Stadium. It was perhaps the team’s only highlight of the past two seasons—the Stingers had two of their wins stripped off after an administrative violation in 2012, and ended up finishing with a 2-7 record. Concordia then went winless in 2013 before head coach Gerry McGrath stepped down at season’s end, replaced by Donovan in February. Donovan, a Concordia alumnus and former linebacker who twice helped lead the Stingers to the provincial final, kept the game plan simple on Saturday: pound the rock on offence, bend-but-don’t-break on defence. 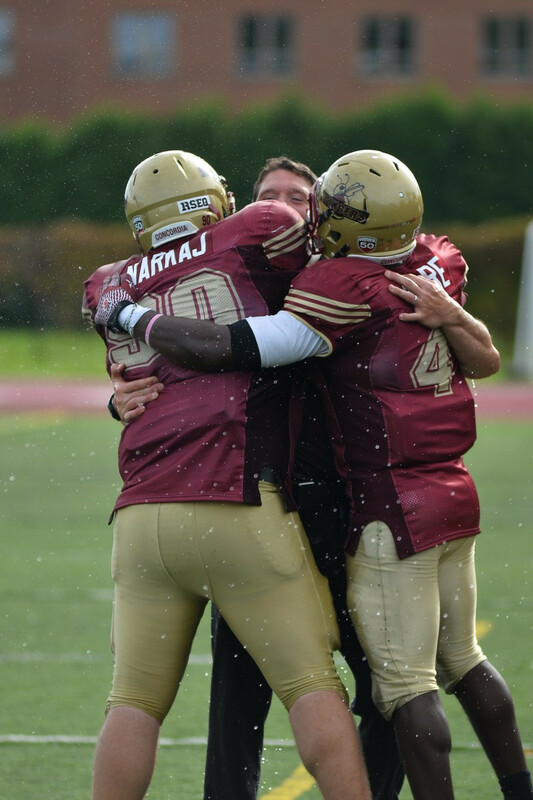 It didn’t bear fruit at first—after trading field goals with Bishop’s and allowing a touchdown in the second quarter, the Stingers found themselves down 13-9 at the half, trying to withstand the rainy and wet conditions. But as the sun finally appeared for the second half, the Stingers’ defence began to shut down the Gaiters’ offense, allowing only two points and recording three interceptions. Among them was a game-changing interception return from linebacker Jeremy Pelletier with over six minutes left in the third quarter. “[Donovan] was telling me the whole time, [Bishop’s was going to throw it] there, it’s going to be there,” said Pelletier on the 43-yard interception return. It led to a four-play, 22-yard touchdown drive that gave Concordia the lead for good. “He put me in the right position. I got the ball. I just put my head down and I just saw daylight,” he continued. Offensively, freshman running back Gunner Tatum, a recruit from Texas, shouldered the load for the Stingers. 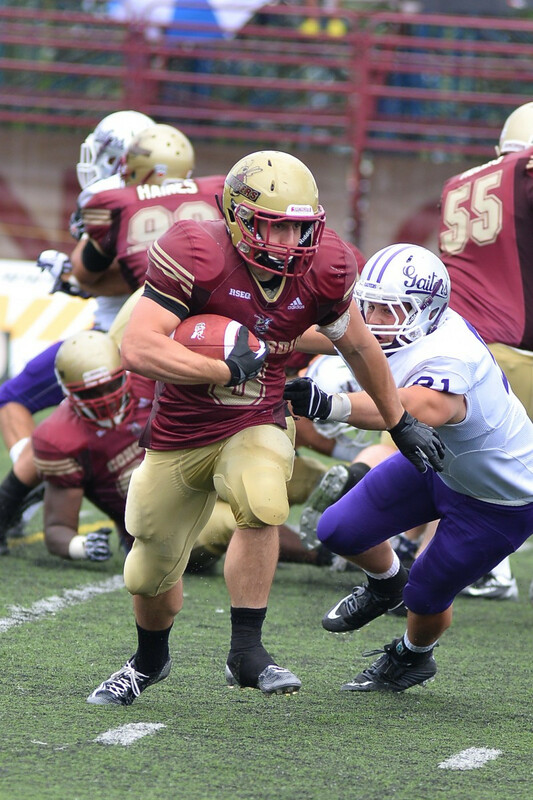 He recorded 192 rushing yards on a Réseau du sport étudiant du Québec record-tying 35 carries, including a short touchdown run in the third quarter. When Tatum looks back on this day, however, his stats won’t be the first thing that comes to mind. The Stingers were so run-heavy in their win, they only needed nine passing completions on 15 attempts from quarterback François Dessureault, who still managed to record a passing touchdown—a 31-yard strike to Henry late in the game. Henry caught the pass mid-stride at about the 15-yard line before making a move on two defenders and bursting into the end zone. The score gave the Stingers a 25-13 lead with just over six minutes left in the fourth quarter, a deficit that proved to be too much for Bishop’s to overcome. 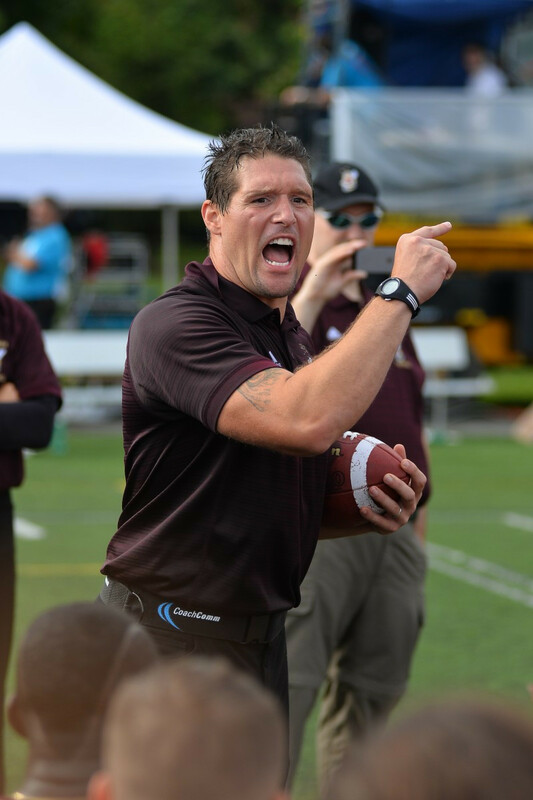 While the Stingers will ride their opening-day high into their upcoming practices, they’re already looking ahead to a matchup against the McGill Redmen this coming Friday—the team Donovan left to become the Stingers’ head coach.